The Solanum quitoense is a fruit native to northwestern South America. You see it pictured here for sale at a stand at Bogota’s Paloquemao Market. 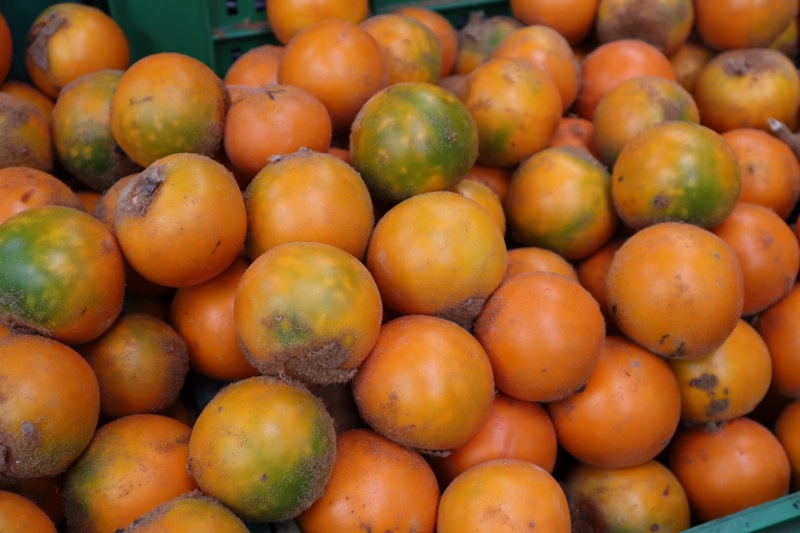 It can be found in a variety of countries including Panama and Ecuador — where it is referred to as a ´naranjilla´or little orange due to its color. In Colombia, it is called ¨Lulo¨, a word from the native Quechua language. It is round and usually measures about 6 centimeters in diameter when mature. The sweet fruit is said to provide a variety of health benefits: reinforcing bone density, improving digestion and helping to detoxify the body, among others. In Colombia, it is often used to make a drink called a ¨Lulada¨made of mashed lulos, lime juice, sugar, water and ice. Make sure to try it when you visit Colombia! ← Cerro Monserrate / Monserrate Mountain, Bogota, Colombia: The Lowdown!